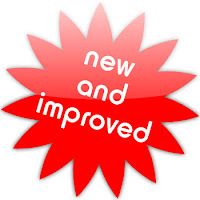 Okieladybug's Scrap N' More: New and Improved....Is it better? Have you ever gotten something that you know you can use but it still intimidates you because it is different than what you are use to using? In my life it seems the pattern is usually men. I get use to one but then they go away and then I have a different one and it is suppose to be new and improved and it intimidates me because it is different than what I previously had and then when I get use to all the bells and whistles on that one it goes away and...well the vicious circle starts all over again. However, today I am not talking about men. Instead I am talking about sewing machines! The sewing machine I use to have was a Kenmore that I bought for myself as a graduation present when I graduated from high school. That should tell you that the machine was AT LEAST ten years old and while I would love for you to believe I graduated only 10 years ago I have to be honest and say that I graduated in 1984 so the poor thing is 28 years old. This is not a picture of my Kenmore sewing machine but it is what it looks like. I believe my friend Linda might have had her husband fix it but we still aren't sure how well it sews. Linda was watching HSN and contacted me and let me know they were having a good deal on a machine that she felt I would be comfortable using. I am proficient at sewing but I don't do a lot of fancy work so all the new machines with their 25,184 features is more than I need. I checked the machine out online and it looked to be what I have been looking for and with the flex-pay option of $40 a month, no taxes and free shipping and handling I figured I could swing it easy enough and off to ordering I went. I received my new Singer sewing machine yesterday afternoon and went directly to reading the manual when I get home. 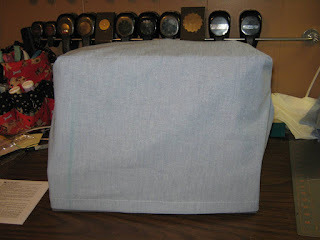 It is quite different than my previous sewing machine but the basics are about the same. I did have to laugh several times when I kept reaching over to the right hand side of the machine to do reverse stitch, something I will have to get accustom to for sure! I had thought the housing was metal but it is indeed plastic but it does feel more durable than the machines I had checked out at Walmart several times. I decided to really check out the machine I would need to sew something and the only thing I could think of to sew was a cover for the machine. I pulled down one of my totes that has fabric stored in it and looked through to just find something to use. I found a piece of chambray that I thought would work fine for a test run. Since the machine came with a little flimsy plastic cover I used it as a pattern. It didn't turn out perfect but that is quite alright since I wasn't out for beauty on this but instead just trying out the machine. Here is another view of the cover from an angle. I did hem it a wee bit short but yet again since it was just a test it doesn't matter much. I do have to say I believe I am going to like the simplicity of this machine and it does seem to sew quite well. I use to sew a lot for my daughter and making things and now maybe I can start doing more sewing. My poor ol Kenmore has been out of commission for a few years now so I shall have to polish up on my sewing skills again.One of my first projects is going to be making a matching shower and window curtain for my little bathroom. I have to wonder if new and improved is better but time will tell in this case! Okie you had me cracking up about the "men". I wasn't sure where you were going with that at first. Have fun with your new machine. I personally have a love/hate with my old sewing machine. In my case I don't think newer would improve my sewing. P.S. I like your cover. I think you did a great job. Your poor little Kenmore is sitting here in my craft room all neglected. And, I bet it stays that way when you get it home! Glad the Singer's working out for you. You can always keep the Kenmore for a backup or to sew on something super heavy that might mess up the timing on your newer machine. That's awesome! I can't wait to see all your creations!! I hope you love your new Singer. My first machine was a Singer.It was bought in Spain when my husband was in the military. It was heavy and he walked a few miles back to his ship with that machine. Years later I gave it to my SIL after buying a new Kenmore. 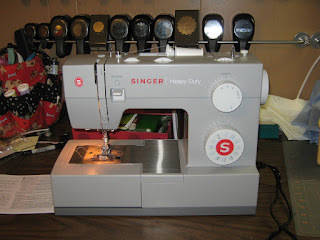 I loved my Kenmore more than the Singer but the Singer is still sewing away while my Kenmore has died. I got married in 1979 and my husband bought me a Kenmore sewing machine that fall. I made many a Halloween costumes and curtains etc.... After 20 years my ex left to ungreener pastures for him but that is another story and his loss (hehehe) however I digress. My kenmore machine still works. Funny thing is, it was in an inconvenient place in my craft room and JUST today I moved it into my new spare room (son moved out) to make it more accessible to do sewing on cards. How timely is your post. 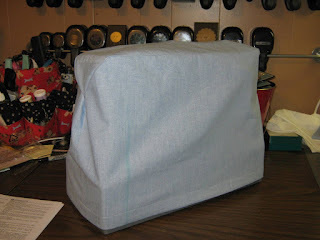 Actually, I think you did a very nice job on your sewing machine cover ... and how easy it will be to pull that cover off when you are ready to start sewing. Like you, my sewing machine is an old one too ... you might even classify it as an antique (or vintage?). *wink* It was a gift from my DH on our first Christmas together. I am going to date myself and admit that the year was 1971. That machine has logged many a mile. At one time, I made all my daughter's clothes, and even some for my son when he was a toddler, plus curtains, quilts, and many other crafty things too. That machine is still going strong and guess what ... it is a Singer! Here's wishing you many years of sewing on your new machine. If it holds up like mine has, it will likely be the last sewing machine you will ever need to purchase. 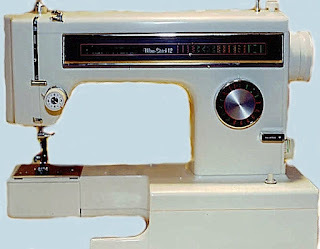 I bought my Kenmore sewing machine in 1977 and am still using it!!! Amazing! You really love sewing though. Looking forward to see your first craft using your new sewing machine! :) However, maybe you can check one of my sewing machine here, kindly take a look at this link brother xl2600i.